This book, while undeniably academic, is perhaps the most important resource for students of contemporary Japanese literature. 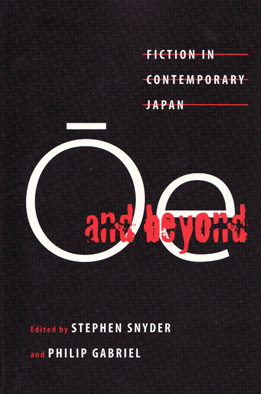 Included in this book are twelve essays by prominent scholars on the biggest names in post-war Japanese literature. There are essays on political writers like Ōe Kenzaburō and Nakagami Kenji, feminist writers like Ohba Minako and Takahashi Takako, and contemporary popular writers like Murakami Haruki and Banana Yoshimoto. Each of these essays aims to look at the writer as a whole, considering his or her major works and themes, while at the same time attempting to evaluate his or her place in the larger body of modern and postmodern Japanese literature. Every essay is a sound piece of scholarly work, and none of the analyses rely on theory unfamiliar to a college graduate. Because these essays are so general and yet so rigorous in their approach, I would like to recommend the collection to general readers, as well as specialists, who have cultivated an interest in a particular writer. You won’t be disappointed by what you find. The short introductory essay is also a wonderful introduction to the state of Japanese literature at the turn on the 21st century. Here is a list of the writers treated by the essays, as well as the authors of the essays themselves. An astute observer (such as myself, haha) will notice that many of the essayists are their subjects’ primary translators, a fact which attests to their close relationship with the authors and their works.